Answering a question in the Ask The Pool Pro section, about comparing above ground pools, has led me to continue the discussion on this page. We will be looking at what is the best above ground pool for you. In the course of this discussion I will use the name Doughboy a few times. They manufacture my favorite above ground pool and I use them a lot for comparisons. This is not an ad for Doughboy pools, there are many quality pools being sold today. There are many things I like about Doughboy pools and a couple of those are very relevant to this topic. Doughboy uses the same high quality consistently across their entire line of pools. Their least expensive model has the same high standards as their most expensive and they are all on the high end of user friendly. The same can be said for Lomart pools, a close relative of Doughboy. In terms of overall quality, and a pool being user friendly, here is a list of my likes and dislikes. These qualities can be found in the best above ground pools, including Doughboy and Lomart. Let's start at the bottom of the pool with the bottom rail. I would look for 1" steel bottom rails. Smaller ones will make the installation process more difficult and there is just no need for it. I will talk a lot about my preference for steel verse resin later on. The bottom rails are not the place for resin. Resin bottom rails are flimsy to work with, have difficulty staying in the connectors and are something I would stay away from. The bottom rail connectors are another place where resin should not be used. I have yet to see resin rails connecting in to resin footplates that were anywhere close to user friendly. When the pool is up maybe they last longer, who knows, but someone has to build that pool before it can be enjoyed. Uprights are next, and the ones that snap into the footplates are the ones to avoid. These can be either resin or steel, I have seen both kinds. The uprights should be held in place at the bottom with two or three screws. The use of resin to make uprights is very common, and for the most part, fine with me. 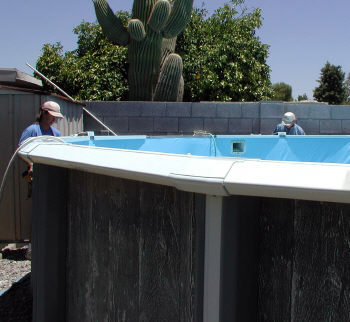 The pressure exerted onto an upright is easily handled by resin, unlike some other parts of the pool. And speaking of uprights, why would anyone think a silly piece of plastic snapped over the bottom of each upright makes the pool look better? It's just a stupid overuse of resin. Now the manufacturers have it, resin, they want to stick it everywhere. It can take three hours to build a pool and another hour to snap these silly things into places they do not want to go. I have yet to see one design where the resin post caps fit the way they were supposed to and were easy to install. Top caps, the parts that attach to an upright, should also be steel. The top rails of the pool will be fastened into these with screws. Driving a sheet metal screw into plastic does not give me the impression of the kind of strength needed to contain 12,000 gallons of water. Top rails that are held in place without screws fall in the category of an over designed pool. Pool manufacturers are constantly trying to reinvent the wheel and it usually just ends up being another headache in the installation process. Top rails are either steel or resin and most of the time both are fine. The exception to that is with an oval pool. The screws that hold a top rail in place will pull right through the resin if there is the least bit of pressure put on them. With a round pool this in not usually a problem. The wall should hold the force of the water, not the top rails. If a faulty installation causes pressure on the top rail, resin rails will separate from the top cap very quickly. With oval pools, even the best installation can cause a little pressure in the corners. The rails coming out of the straight sides, going into the curved end, need to be able to stand up to a little force pushing against them. Way too often they do not hold, so my opinion is stay away from resin top rails on an oval above ground pool. The decorative top caps, or connection covers, are another place where over designing has become all the rage. I prefer a two piece steel cap, held in place by two sheet metal screws, over anything else. Steel caps can be hard to find as many models now come with resin ones. I would not base a buying decision on this, it's just my preference. Three piece resin caps are just silly, just a waist of time and plastic. One piece caps can be OK if they are held in place with a screw. Caps that snap on, or snap together, without screws, are my least favorite. Pool walls and warranties are a big concern for many. The best warranties are not always the best above pools. I prefer a well coated steel wall over all other options, not even a close second worth discussing. The question is how much do you want to pay for that 50 year warranty and is to really worth it. Think long and hard about how long you are going to be using that pool. People move every few years, the pool may or may not get moved also. The kids grow up and the pool may see very little use. Pools take money to maintain and that money may be better spent somewhere else after a few years of pool ownership. The reasons for selling, or taking down, your pool are endless. How long will you want this pool is the question. Give it some serious thought because those long warranties are expensive and are very seldom ever used. Are you going to change a liner in 30 years, find some rust on your pool, and have a new one sent to you under warranty. If you really think so read the fine print and see what it is going to cost under a prorated warranty. Most prorated warranties cover the manufacturers actual cost after just a few years. You may get the impression I go for the simpler, less expensive, pools, and you are right. If money is a consideration, and when isn't it, I would put far more importance on the equipment package than a pool with all the bells, whistles and excess resin hanging off it everywhere. A top of the line filter, a good automatic cleaner and a safe comfortable way of getting in and out of the pool, will make any model enjoyable. This is the Montessa line by Lomart. It is their least expensive model, but that does not mean it is a cheap above ground pool, the Lomart quality is built into all of their pools. Use the specs on this pool as a basis of comparison when shopping for the best above ground pool. The Lomart Montessa pool has a 52" sidewall, 6" top rails and 5" uprights. It is an easy to install pool and an outstanding value. easily one of the best above ground pools. Lomart also makes the Regency line of above ground pools. These are a little fancier and a little pricier. They are packed full of the quality you can expect in every Lomart Above Ground Pool.